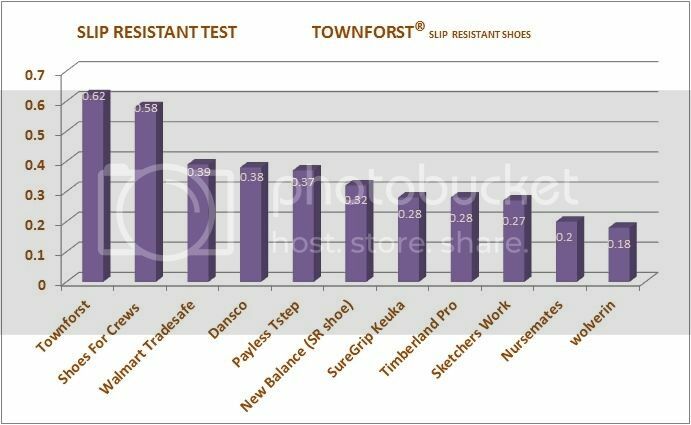 Professional Slip Test by Intertek: Townforst® slip-resistant outsole reaches the highest level of Slip Test. Specially designed for professionals in the restaurant, health care, and service industries. Effective: These slip resistant smart shoes provide shock absorption,friction free condition and extra hours of comport with its lightweight flexible mid-sole and cushioned insoles. Fashion style: Look good on and off work! You are sure to find a style of your taste with a wide style selection from top shoes brands. Find your groove on the job in the Flats from Townforst Work. We set up our own research and development department, focusing on researching highly slip-resistant outsoles patterns continuously. Our outsole is made from rubber compound that grips the microscopic roughness of the floor surface. We liquid patented micro-channel tread pattern channels away from the bottom of the sole to make shoes tractive on all types of wet and greasy floor surfaces. This test was performed in December 2013 by Intertek on worn, smooth, greasy/wet restaurant quarry tile, and coated with water and Crisco brand shortening using Mark II Slip Resistant Tester according to ASTM Standard F1677-2005(Olean Quarry Tile) and Slip Resistance Tester using ASTM F2913-2011 (Clay Tile Surface, Vertical Force: 500 N, Room Temp). On a scale where 0.0 is the absence of friction and 1.0 is very high friction (e.g. dry carpet), Townforst rated more than 1.0 on dry condition, 0.83 on wet condition,0.43 on mixed oil and water condition(0.05g oil+25cc water)-more than tripling or doubling most of the competitors in shoe marketplace. Our R&D department always focusing on launching variety styles of shoes continuously. We design and manufacture our own shoes and always provide customer with unbeatable quality and price. Our shoes styles look fashion on and off work! You are sure to find a style of your taste with a wide selection from top shoes brands. With more than 100 styles to choose from to enhance the comfort and fit of your shoes. Townforst satisfy all of your slip-resistant and fashion footwear needs! Shipping Policy: USPS 2-day priority mail to ship 1-2 items, UPS for 3 items or above. We offer free return shipping for damaged or defective items, customers will be responsible for paying return shipping costs for size and other issues. Our policy lasts 30 days. If 30 days have gone by since your purchase, unfortunately we can’t offer you a refund or exchange. 1. Please email us at townforst@gmail.com.We will provide a RMA number sheet. 2. Please fill in the RMA sheet and print out. 3. Put the RMA sheet with the shoes into return package. 4. Once your return is received and inspected, we will send you an email to notify you that we have received your returned item. We will also notify you of the approval or rejection of your refund. If you are approved, then your refund will be immediately processed, the refund will automatically be applied to your credit card or paypal account. The amount will show up immediately with paypal account, and 3-5 business days for credit card refund. Drop us a line and we'll be sure to get back to you within 12 hours. Copyright © 2019 Townforst. Powered by Shopify.